The EZR range of mobile high density shelving and roller racking systems can increase storage capacity by as much as 100% throughout a range of working environments. Whether you are storing archive materials, library books, office files or even retail stock items, a high density mobile storage solution can dramatically transform the efficiency of your office, library or stockroom. 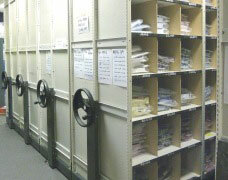 The main advantage of roller aisle racking is the large increase in capacity it gives when compared to static shelves. By eliminating the unused space between runs, this type of shelf compactor reduces the floor area that is required - thus allowing either more shelves to be fitted or a reduction in the space allocated to storage. Mobile shelving systems are not overly complicated, standard shelving units are mounted on to sturdy wheeled bases that move along specially engineered floor tracks - creating a concertina effect. It is this movement that compacts the units down to their minimum size whilst still allowing quick and easy access to every unit. 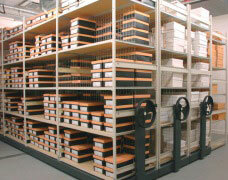 Our rolling high density storage systems are built from high quality, commercial grade modular racking components. 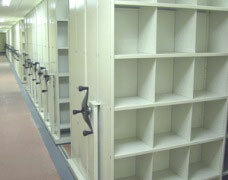 Because of this, we can offer a wide variety of differently sized units (in either cabinet or racking configurations). In a library, mobile book shelves can be designed with standard publishing sizes in mind but in a stockroom situation, the varied profile of the goods (much of which will change in the future) requires more careful planning. "Mobile storage systems require no extra building work, reducing disruption to your business." These high capacity storage shelves are movable via the use of mechanical rotating handles, electric motors or by simple manual pull handles. A selection of finishes are available to match or co-ordinate with many different environments. All offer a versatile solution perfect a wide variety of commercial applications that include: legal/accountancy, libraries, retail stockrooms, medical records, general office filing and museum storage. EZR Shelving are one of the UK's leading mobile shelving suppliers with over 30 years experience of providing high quality mobile racking systems and compact roller shelving solutions. 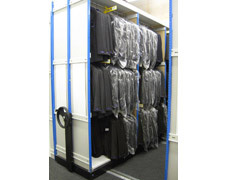 Whatever your requirements, we can install a cost effective wheeled storage racks to match any business need. If you are looking to improve your storage facilities with high density roller shelves then please call us today on 01993 779494 and challenge us to see if we can double your current storage capacity. How does a mobile storage system work? 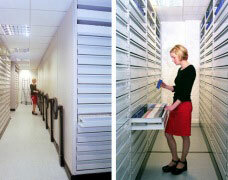 Shelving bays are fixed to mobile bases which, in turn, are fitted to specially designed floor tracks. 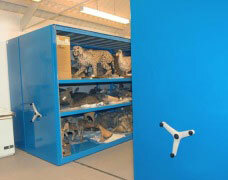 It is these 'shelves on tracks' that enable each aisle of racking to move (retract), giving access to the next row. 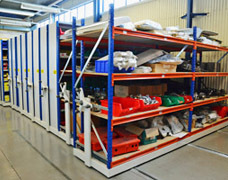 Several rolling storage racks can be moved at the same time to improve access times to any given section, safety locks protect the users whilst the shelves are in use. 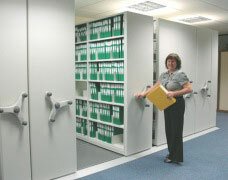 Retrieving files, books or stock contained within the mobile racking system is as simple as pushing or pulling the grab handles fitted to the units. Rotating hand-wheels are a popular upgrade to create a truly effortless way to access the shelf levels. Motorized roller shelving units can open and close sections at the touch of a button, this technology also forms the basis for 'intelligent' movable shelving solutions that can automatically open the correct aisle based upon the user's request. In instances where there is very little floor space available but plenty of wall space, slide-to side shelving systems offer a practical alternative for high density office file storage. Our helpful demonstration video shows how a typical movable rolling shelf system works in an office setting. 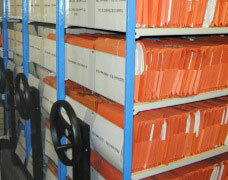 Can the roller racking systems be moved to new premises? Yes, all of our mobile aisle shelving units are designed in a way that facilitates several assembly and disassembly procedures - this maximises the life of the storage system. We can provide installation crews to transfer mobiles to new areas or premises within your business. How many access aisles are needed? 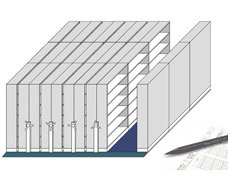 The client can choose how many 'floating' aisles are provided within the mobile racking system but it does all depend upon how the storage unit is being used. 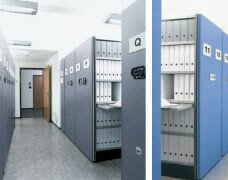 Low frequency access can be accommodated by just one aisle and this will provide the maximum storage capacity. Shelves that are accessed frequently by more than one person at a time typically need one or more extra aisles to allow for efficient retrieval - at the expense of some storage capacity. Will it look out of place in our office? Certainly not, our office rolling shelves are designed to be aesthetically pleasing and each space-saving shelving system can be tailored to suit the environment it is being used in. A wide variety of paint finishes and even customised graphic panels are available to co-ordinate with corporate colours, branding and existing office decoration. We already have some static shelving, can it be converted to mobile? Typically yes, our chassis base can be used as a mobility platform to give greater storage capacity and is compatible with a wide range of standard unmovable storage racks. As long as the existing shelf system is in good condition and strong enough to cope with the lateral movement of the roller base, then a wheeled shelving conversion should be possible. Our sales team are familiar with a diverse range of racking systems from many different manufacturers and will be able to identify any potential issues. 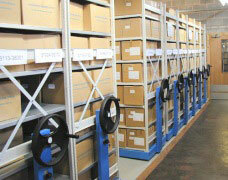 How much does a complete roller racking system cost? 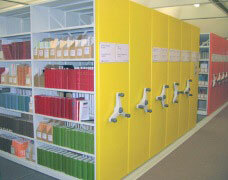 We do offer standard mobile shelf kits starting from just £2,600 in a selection of primary configurations. In many cases these provide a good base guide price but high density compact shelving systems are usually designed and built to order based upon the needs of each individual business. 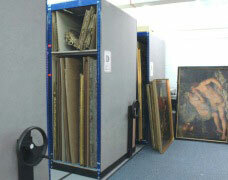 Although there are many factors to consider when trying to achieve maximum capacity, an important one is shelf size. Our compact mobile racking bays are highly adaptable and supplied in an extensive range of widths and depths to suit anything from files to shoe boxes and even large objects like furniture. Adjustable storage shelves help maintain an optimised stores area that can adapt with fluctuations in your stock profile - keeping wasted space to an absolute minimum. We offer free no-obligation quotations, mobile storage design service and site surveys to help you make the most of your space. Our sales team will discuss your requirements in detail and then recommend the best high density storage system based upon your specific needs. During the design and consultation process we are happy to supply detailed CAD drawings and technical specifications to help you get your roller racking project approved.